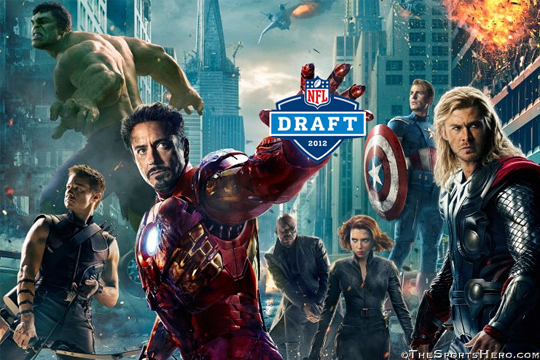 Take a look at what I’ve come up with in our first ever NFL MOCK DRAFT: THE AVENGERS EDITION. Replacing a legend like Peyton Manning, who led the Colts for 13 years, won’t be an easy task for Jim Irsay and the Colts, but their abysmal season has given them the chance to draft a once-in-a-generation talent in Rogers. Rogers has shown the ability to lead a team no matter the circumstances, or decade. Drafting him first overall is a no-brainer, and Rogers has what it takes to lead this team into battle on the field for the next several decades. The Redskins gave up a lot to trade up to the number two spot, but Fury is worth the risk. A leader in his own right, Fury ranks just below Rogers on my big board, and some scouts even have him ranked above Rogers. Fury’s resume has shown he has what it takes to deal with, and lead, people of all personalities, and in a locker room as crazy as the Redskins that will come in handy. Mike Shanahan has been searching for the heir apparent to John Elway since Elway retired, and in Fury, he may have finally found his man. There’s been a lot of talk that the Vikings will look to trade this pick, but assuming they stand pat, Banner is their guy. The Vikings need someone to solidify their offensive line, and with Banner anchoring the left side for the foreseeable future, Christian Ponder and Adrian Peterson have the chance to put up monster numbers (no pun intended). There are some concerns about his attitude, however. Some scouts have cautioned that Banner can be a bit of a hothead. One scout told me, “You wouldn’t like him when he’s angry.” But for a franchise looking for a solid OT, Banner is worth the risk. Barton’s stock has risen over the past several weeks as scouts have watched more and more tape on him. Perhaps not as well known as some other members in this draft class, Barton is a solid pick who can help the Browns instantly at the QB position. His pinpoint accuracy and ability to follow orders make him the natural choice for Cleveland, who has been searching for a franchise QB since they rejoined the league as an expansion team back in 1999. Picking him at number four may mean the Browns will have to pay him more than they’d like, but in the long run it’s the right choice. It’s rare to see a foreign-born football player go so high in the draft, but Blake’s upbringing in Asgard has given him all the tools needed to be a defensive force in the NFL. While his looks resemble that of Green Bay Packers LB Clay Matthews, Blake’s strength and agility are off the charts. His showing at the combine in February had scouts calling his skills, “almost god-like” and “out of this world.” Lining Blake up on the defensive side of the ball alongside DT Gerald McCoy gives the Bucs the foundation for a solid defense that can finally put some pressure on New Orleans QB, and division rival, Drew Brees. Stark has seen his stock fall in recent weeks. While his talent and IQ are undeniable, his off the field issues, which include excessive partying, drinking, and womanizing, have raised red flags among almost every scout I’ve spoken with. He’s also a bit of a selfish player. As one scout said, “He doesn’t play well with others.” He’s a risk at the number six spot for St. Louis, but if Stark gets his act together, he could end up being the steal of this draft class. It’s really hard to evaluate Romanoff because there’s not much tape of her to look at. We saw hints of what she’s capable of when she played alongside Stark back in 2010 in the infamous (Justin) Hammer Bowl, but since then scouts have had little to go by. While her talent is undeniable, most scouts have her pegged as a late first round to early second round pick. But from what I’ve been hearing, the Jaguars are enamored with her, and after narrowly missing out on Tim Tebow this offseason, they may look to bring Romanoff in to compete alongside former first rounder, Blaine Gabbert.